As most of our readers know, from Aquarium Frontiers to Advanced Aquarist, we have essentially tried to provide our hobby with advanced/cutting edge information and information that is scientifically defensible – the health of the sea creatures we maintain in captivity depends on accurate knowledge, not the smoke from some self styled expert’s opinion pipe. This is not a photo of a fish or coral, but of Sanjay Joshi, Ph.D. to whom our hobby owes a great debt for the body of knowledge he has amassed over the last decade. Certainly, science has not provided all the answers. If it had we would be able to keep Crinoids alive in captivity today. And, there is a place for anecdotal information, especially in areas where there is little or no experimental data to help us. However, one of the problems with anecdotal information born from an aquarist’s observations is that it often represents a small sampling of data, too small to satisfy one of science’s tenets – repeatability. You may have noticed that the photo accompanying this editorial is not of a fish or coral, but of Sanjay Joshi. For years, reef keepers have argued about the relative merits of the bulbs we use to provide the necessary photons (light) for our photosynthetic organisms. Today, thanks to Sanjay, and others like Dana Riddle, Gregory Schiemer, and Richard Harker we have an enormous, and growing body of scientifically defensible knowledge of the means (bulbs, reflectors, ballasts, etc.) we use to provide the illumination to the animals that require it. In this issue you will find part 2 of Sanjay’s experimentation with 250-watt MH bulbs. 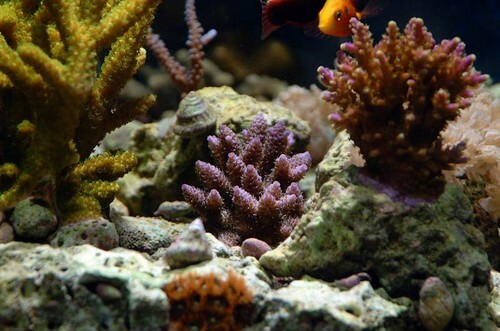 The issue of the artificial salt that we house our animals in, its utility when compared to natural seawater – whatever that is – along with the matter of trace elements, is another area in reef keeping that has stirred considerable debate for a number of years. I’m very pleased to announce that beginning with our September issue, Tim Hovanec, Ph.D. will present a 3 part series on the constitution of certain artificial salt mixtures, trace elements, and will conclude with an analysis of certain recent studies that he plans to show are flawed. The beauty of science is that it is not dogmatic, but self-correcting. “Part 1: A Chemical Analysis of Trace Elements in Synthetic Sea Salts and Natural Seawater.